When and where did you start skating? My first five years were spent in Africa. I ended up learning to skate at the age of five, like any other little Canadian boy, when we moved to the Snowbelt (north of Toronto) - that’s where I would have started. If I’m skating, it’s about ten minutes, and if I’m walking, it’s about 25. So it’s definitely less time, but you need to think about putting the skates on and off, the quality of the ice, etc. Multiple factors influence the length of time that it takes. Any embarrassing skating moments this season? I’ve yet to have a spill this season but the canal only just opened. But last season, I had several. The darker it is, the more likely I am to hit a crack and end up sprawled onto the ice. What’s been your favorite skating moment this year? Skating with my kids! 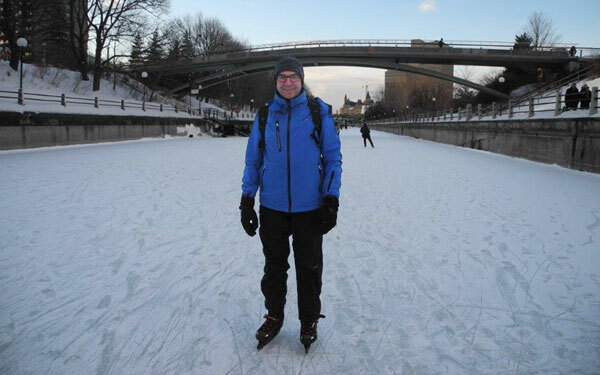 I went skating the first day the canal opened with my kids; we skated end to end and had a beavertail (of course!). Playlist, podcast or the sound of skates scraping the ice? It depends. In the morning, just the sound of my skates. In the evening, I like to listen to podcasts. Would you encourage students and staff to start skating on the canal? Absolutely, we have this incredible gift: this outdoor skating rink right next to campus! Coming from Niagara to Ottawa, everybody was making fun of me when I left. They would say, ‘’Ottawa is so cold’’! But now that I’m here, I love that we have real winters! If you’re going to have a winter, have a full on winter! Dress appropriately and enjoy it! Any advice for students and staff that haven’t started skating yet but are thinking about it? Just take your time and ease into it. Have a beavertail and a hot chocolate. In fact, just do that first! I’m easing into it too! I haven’t got the long blades yet. I think I’m going to work up to it. At first, I had my hockey skates, but they took forever when it was minus 30 to lace them up in. So, I got these ones that lace up much quicker. Thanks for sharing, Dean Kee!